The Ibanez 2018 SRMS805 Multi-Scale Bass Guitar offers an exceptional performer that is perfect for laying down smooth grooves. Since their introduction, the Ibanez SR series has pushed the boundaries of what can be achieved with regard to bass guitar design, at prices that make them accessible to all players. The multi-scale design switches things up with regard to fret placement and string length, and once you try one out, you'll wonder why it hasn't always been this way. The SRMS805 is crafted using mahogany, a beautiful tonewood noted for its rich and vibrant mid to low-end energy infused with an impressive warmth. Paired with this is a poplar burl top, which exhibits the natural grain beneath the finish for all to admire. The body is shaped to the SR profile, and slim and slender arched body with curves in all the right places. The bevelled edges pair with the beautifully executed contours to ensure that whether you sling the bass low, or like to wear it high, you are assured the most comfortable playing experience. The neck and fingerboard adhere to Ibanez's multi-scale design, which allows each string to have the optimal scale length for improved resonance, sustain, and consistency. Angled fret markers are ergonomically designed to suit the natural position of the hand, resulting in a smoother and more seamless flowing feel across the entire neck. 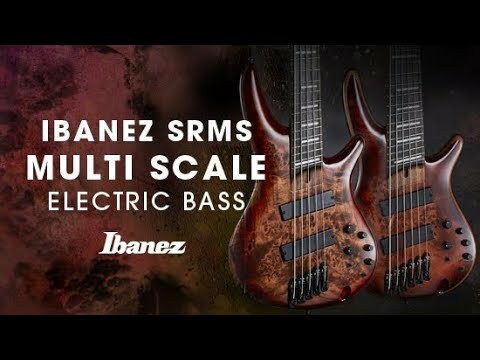 Whether you're familiar with 5-string models or not, Ibanez have crafted the SRMS5 to ensure your fingers become accustomed to the multi-scale design promptly. The SRMS805 is fitted with Bartolini BH2 pickups at the neck and bridge positions, which are designed to translate the transient response of the strings, warmth of the tonewoods, and neck/fingerboard partnership, immaculately.